Sakai knives have been evolving in the last 600 years. 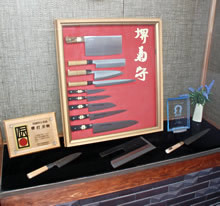 Now Sakai traditional knives are popular and widely known among many chefs. We will continue to develop cooking knives with skillful craftsmen. We wish to support the cooking culture by supplying knives with "Sharpness".